The Venus Fly Trap (Dionaea muscipula) is the most well known species of carnivorous plants. These insectivorous plants lure their prey using a sweet smelling nectar. When an insect lands on the head of the fly trap, they seek the source of the nectar, and if the plant is lucky, it will touch one of the many trigger hairs located within the jaws of the trap. Once triggered, the trap snaps closed, trapping the victim. The plant then secretes an enzyme which essentially 'dissolves' the insect, turning it into a digestible dinner. After a few days, the fly trap will re-open, to await it's next victim. 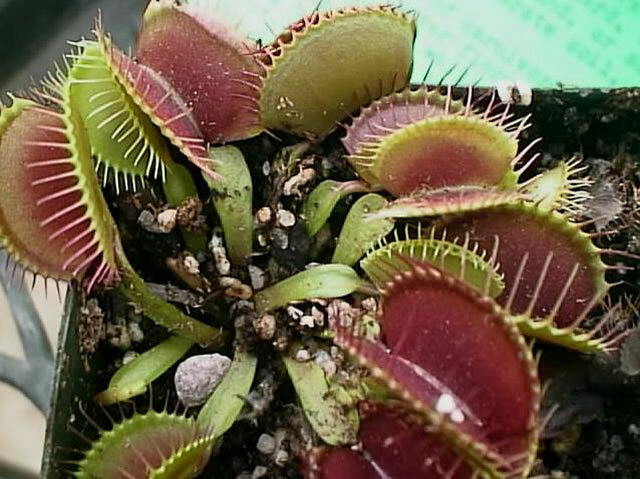 Venus Fly Traps are quite easy to grow, as long as they are given the proper growing conditions. like you would find in a terrarium is ideal. The potting mixture should consist of a mix of 70% peat or sphagnum moss and 30% perlite or coarse pumice. Venus FlyTraps are extremely sensitive to chemicals, so you should only use distilled water or rain water. If it is absolutely necessary to use tap water, allow it to set for 24-48 hours in an open container, to allow the chlorine and any other chemicals to dissipate. provide them with all the nutrients they need. 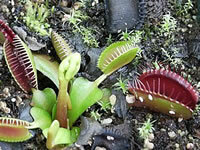 Venus Fly traps have an active growing and feeding season, from May through October. During this period the soil should be kept constantly damp. Temperatures should be kept between 70° and 95° F. During the winter, Fly Traps require a dormant period of about three months. At this time, much (if not all), of the foliage will die back. The entire planter should be moved to an area where the temperature will remain at 45-50 degrees F., or the bulb may be removed, sprayed with fungicide, wrapped in damp, live sphagnum moss, placed in a plastic bag, and moved to a cool area. This will keep the humidity around the plant higher and it will ensure that the plant has a constant source of moisture. If your plant is growing in a terrarium, you will have to provide it's food. Your Fly Trap will consume 2 or 3 small insects each month. Dead flies and insects can be used, provided that they died of natural causes and not by poisons. Never, never, never feed your Venus Fly Trap any hamburger. The fat content in burger will be fatal to your plant..
Artificially springing the trap, i.e. 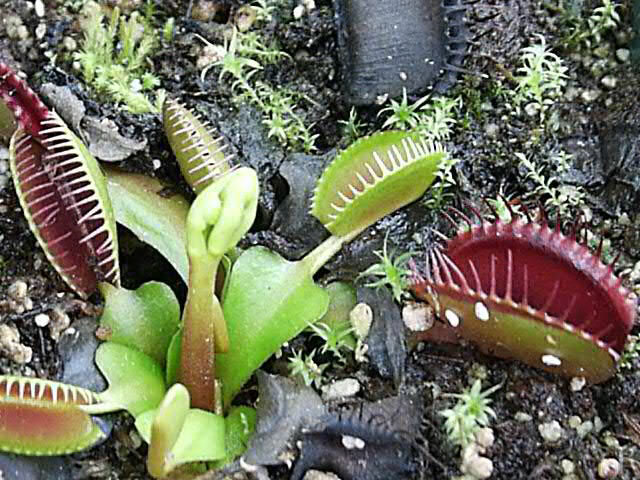 poking it with your finger, drains the FlyTrap's energy. If this is done too often, the fly trap head will become less sensitive and possibly die. Always keep dead leaves and heads cut off to prevent fungal infections. Dead leaves and heads are a part of a Fly Trap's life cycle, and do not necessarily mean that the plant is unhealthy. How to Grow and Care for Carnivorous Plants.